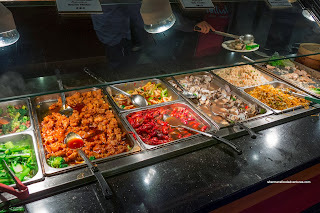 I get asked often as to why I visit buffets so often when I'm in the States. The answer is pretty simple really - it serves to fill up our tummies and there is always something for the kids to eat. 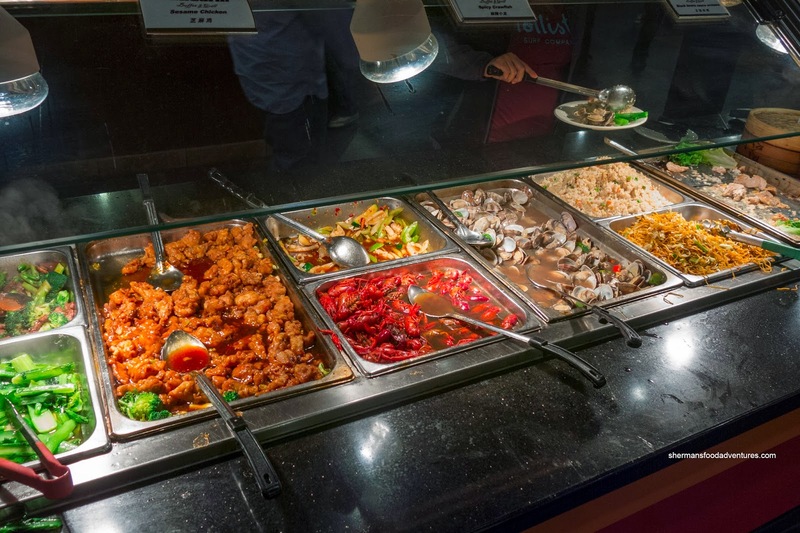 Believe me, I realize the compromises that need to be made since finding outstanding food at a buffet is as likely as Miley Cyrus being classy. 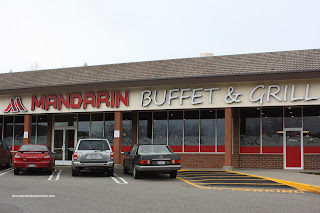 So to emphasize the convenience of it all, we headed back to Mandarin Buffet for a revisit since we were staying nearby. 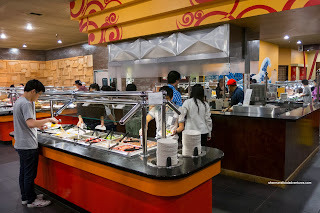 One thing I particularly like about buffets in the States is that many charge per year for children. Hence, the costs don't go out-of-control like in Vancouver where you'd pay full-price for some older kids. 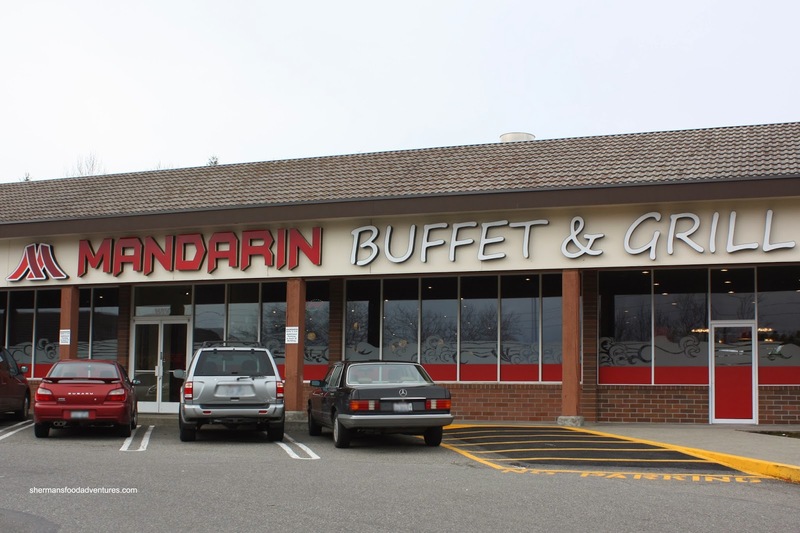 Mandarin Buffet is comparable to some of the other ones in the area including Haiku, Blue Fin and Mizuki. In other words, it means the selection encompasses everything from sushi to pizza. 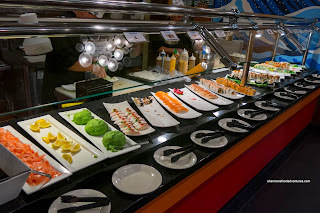 On the topic of sushi, I found the varieties to be decent, yet the overall quality to be mediocre. 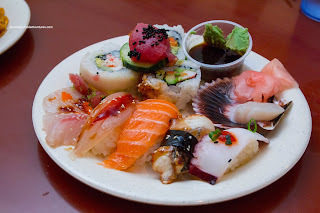 Compared to Mizuki, the rolls didn't look as appealing nor was there any sashimi to be found. Naturally, the sushi rice was texturally off being dry and flavourless. To be fair, it was all edible and acceptable for a buffet of this type. I did enjoy the hotate (scallop) served on the half-shell though as it was buttery and surprisingly fresh-tasting. 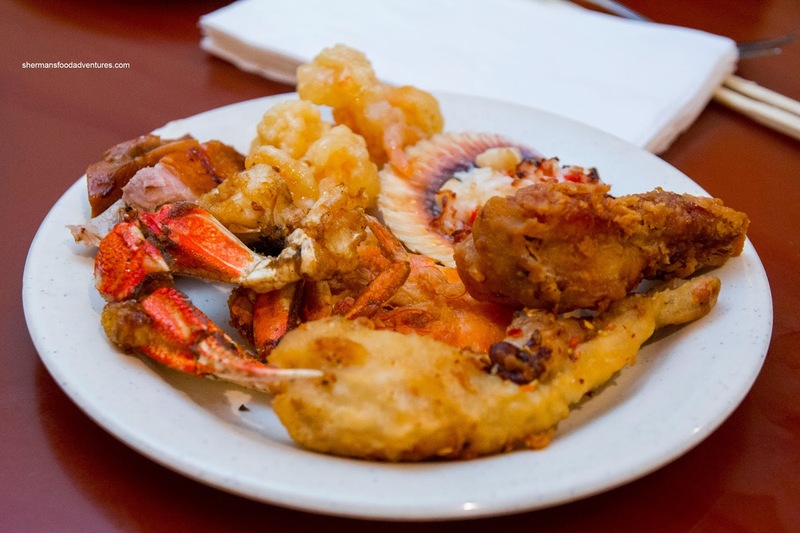 Moving onto some cooked items, the first station featured items such as crab, fried frog legs, honey shrimp, chicken wings, fried shrimp, teriyaki chicken, fried banana, French fries, baked baby scallops and pizza. As expected, the crab was not that fresh while the shrimp were frozen. The honey shrimp was pretty decent being crispy and laced with a sweet mayo sauce. Incredibly large, the fried frog legs were somewhat moist. The chicken wings, on the other hand, were dry albeit crunchy. I didn't bother to try the pizza. Next section consisted of Chinese food in one from or another. Representing the "Dim Sum" was sweet sticky rice (which we hated), sui mai, tripe and chicken feet. Pretty subpar including the dry sui mai and soggy tripe. 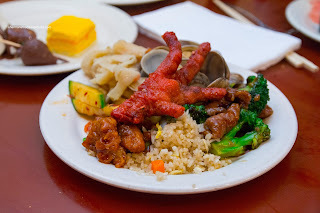 However, the chicken feet were really good being plump and gelatinous. In addition, there was Shanghai bak choy, broccoli beef, sesame chicken, squid, crayfish, clams, fried rice, fried noodles and salmon. The veggies were all okay if not a bit greasy. I found the sesame chicken to be dry and chewy. The clams were pretty plump though where I had a few helpings. Not sure why the salmon was in this section though. No matter, it was dry and pale. 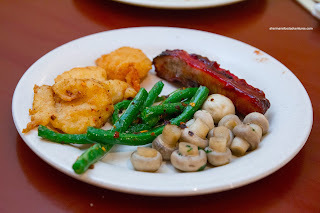 Last hot section consisted of soups, breaded shrimp, Chinese-style ribs, fried fish, fried wontons, creamed spinach, green beans, button mushrooms, spring rolls and fried sesame glutinous balls. Nothing to see here except for the crispy beans. 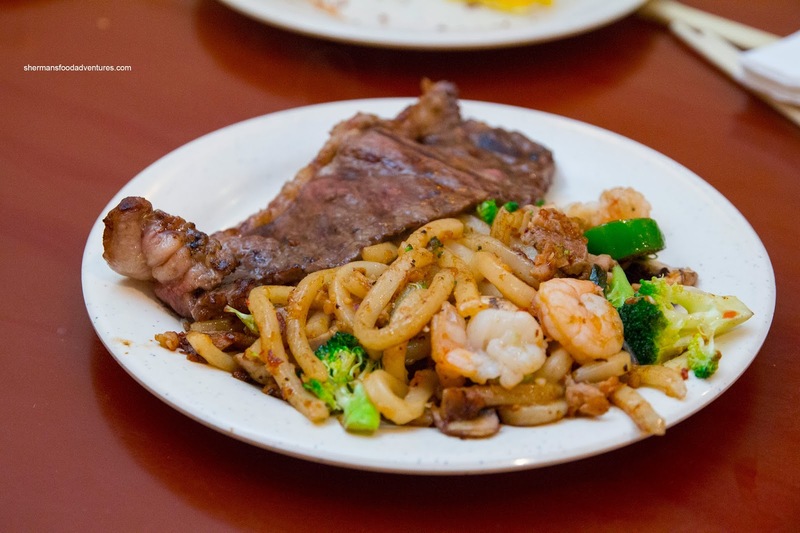 Lastly, we shared a dish from the Mongolian grill section. Pretty typical stuff with noodles, veggies and meats. Of note, as a public service announcement, stay away from the steak unless you consider the bottom of your shoe to be tender. I didn't bother much with the desserts or salads, but the kids did enjoy the chocolate fountain. Yah, yah... 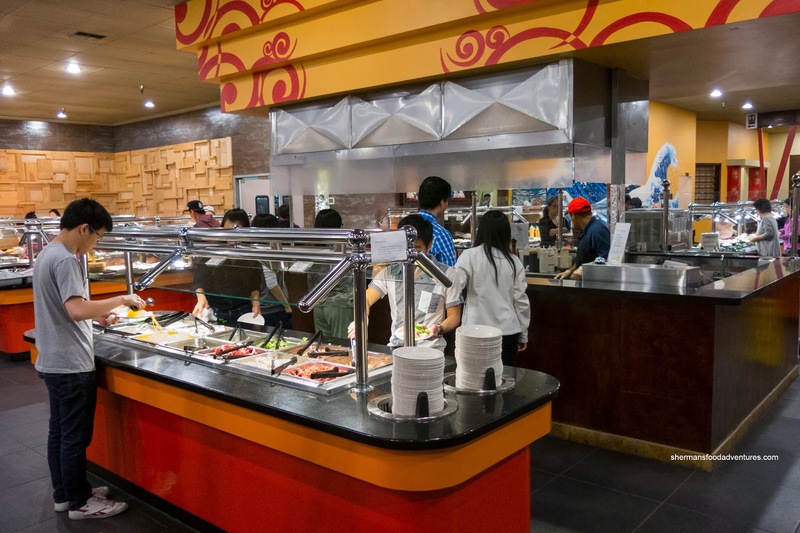 I can feel the buffet haters rolling their eyes at this moment. Hey, I don't disagree with you, but in the end, the kids were happy and it didn't cost us an arm and a leg (and there were some edible items).